Sometimes I think Americans can be a bit...behind. I mean, we have almost no interest in soccer, which it seems the rest of the world finds to be the single best sport ever. Our fashion sense can be a little unique, and I've heard that our cell phones are children's toys compared to what some other countries have. And we don't really eat all that much goat. Which, it turns out, is the most widely eaten meat on the planet. It's time to catch up. So when I was asked if I'd like to review the latest book from Bruce Weinstein and Mark Scarbrough (let's not forget that last year the couple gave us what I am sure is the only Easter ham I will ever need), I think my answer was obvious. So let's talk goat meat. Although goat cheese, as the pair says, has morphed from a "gag-me no-no in the Mad Men sixties to the full-on cliché it is today," goat's meat is not so easily found. It may be the world's primary meat, with almost 70 percent of the red meat eaten on this planet coming from from those bearded little creatures, but you'd never know it in the US. Weinstein and Scarbrough urge us to consider India, Thailand, China, Bali, Nigeria, Kenya, Jordan, Saudi Arabia, Israel, * takes deep breath in* Mexico, Costa Rica, Barbados, and Brazil. The pair also point out that goat has largely escaped the kinds of mass production that is ruining other sources of meat (see Mark Bittman, Michael Pollan and Eric Schlosser on this point). And, as if this animal weren't magical enough (cue Simpson's clip), it has fewer calories, less fat (both normal and saturated) and less cholesterol than chicken, beef, pork or lamb (all of this according to the book). Okay, so now that we're convinced about at least giving goat meat a shot, there's the problem of finding it. Even in NYC, this isn't as easy as a trip to the local supermarket. Weinstein and Scarbrough provide a list of sources in the book, many of which offer mail order, and one of which is even located in Brooklyn. But I was getting a little antsy and didn't want to wait around for the mail, especially because I don't have a doorman and didn't want to risk goat-theft. So Chinatown it was. 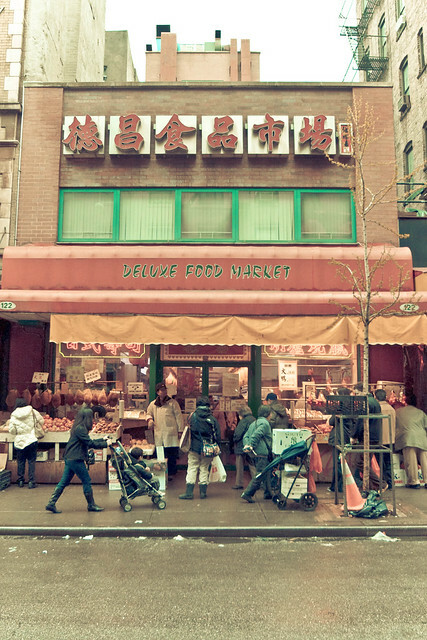 And on the recommendation of someone who really knows where to shop in Chinatown, I found my leg of goat at a market called Deluxe Food Market, which is on Mott Street between Hester and Grand. So armed with a goat-leg, I picked The Seven-Hour Leg because it sounded obsessive, which is kind of what this project is all about. It's a French technique call gigot de sept heures and although Weinstein and Scarbrough claim that only French grandmothers have the kind of time necessary to sit around basting a goat leg for seven hours, it turns out that American grad students do too. 3. Transfer the leg to a carving board, drop the heat under the pan to medium, and toss in the garlic and all the herbs. Stir them around for a few seconds. then pour in the wine and broth. Whoosh! Scrape up any browned bits in the roasting pan as the liquid boils. 4. Set the leg back in the pan. 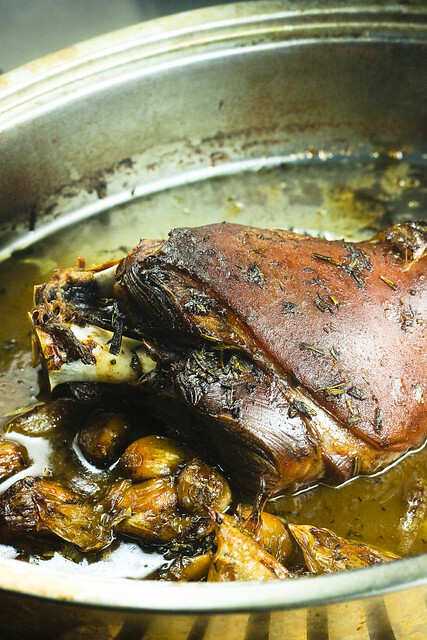 A goat leg is not rounded; instead, it has two meaty sides. 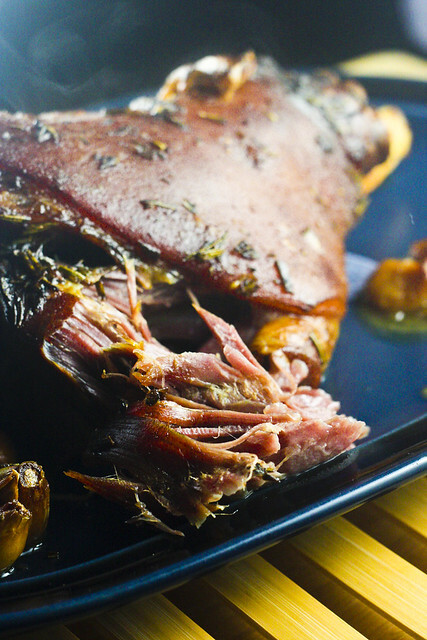 You'll want to roast it with the meatier side facing up. Cover the pan tightly with aluminum foil. Place it in the oven and bake for 3 1/2 hours, basting occasionally. This is a tricky bit: uncovering, basting, re-covering. It's probably why this dish is such a classic: Only French grandmothers have this much time on their hands. Of course, they do because of their 35-hour work weeks and universal health care and state-backed pensions and...Sorry. Just make sure the foil is sealed tight after each basting. 5. Uncover the roasting pan and drop the oven's temperature to 275F (135C). Continue roasting for 3 1/2 more hours, basting occasionally, making sure that the leg stays moist. Baste more now than you did before, because the thing is uncovered. At the end of it all, that leg will almost be confit: tender, meltingly sweet, crazy-delicious, and perfect. Transfer the leg back to the carving board. The task of carving this thing isn't that big a deal, since it will basically fall apart into chunks and pieces. You can slice these down into more manageable bits. 6. Finally, if you like, swirl the butter into the very small amount of pan juices left in the hot pan, to make a simple sauce. Bruce things this excessive. (Cooking a goat leg for 7 hours isn't?) I think of butter as a beverage. In any event, remove the bay leaves before serving the sauce. I love this post, Andrea! 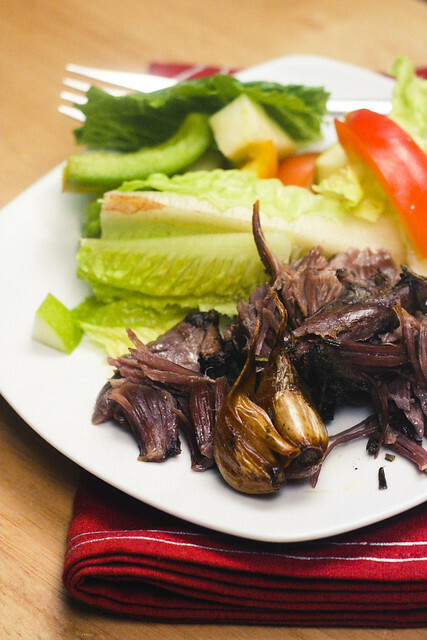 I've never thought about goat meat before and you make such a great case for it, as does this particular recipe. Our Whole Foods JUST started carrying it. 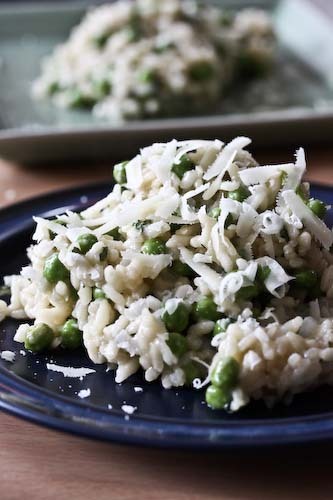 It's pricier than I think it should be (more expensive than the grassfed beef) but I want to try it... and I think this is the perfect recipe! Thanks! Hooray for goat - yours look fantastic! I've been dying to try cooking it myself since I had some braised goat over polenta at a restaurant in Point Reyes, California. I live in the San Francisco bay area and one of our local farms has started selling it around here, so I will get to cooking - thanks for sharing! That looks amazing...is the flavor similar to lamb or gamier? I picked up the book the other day and was instantly intrigued. Lover of goat cheese that I am, I've never eaten or prepared goat meat. I guess availability is a big factor - I know it will involve a trek down to my international farmer's market, Soulard in St Louis. can you do this with lamb? If you want to get goat that is not gamey, it is best to know your goat producer, so you can ask them some questions. Do they castrate the males when they are about 3 months old or younger? What do they supplement feed the goats if they need to do that? Etc...Males that are castrated tend to be less gamey than those that are not. To find local producers and help them to keep producing because they get all the money instead of only a tiny bit like those people who have to sell to operations like Whole Foods, check out Local Harvest for your area - or EatWild or various other sites like that which can put you directly in touch with a goat farmer/rancher near you. Many of us now have our own private label cuts, so you may not have to buy a whole, half or quarter goat to get goat directly from a farmer/rancher. It is delicious, but requires careful cooking and I do not recommend cooking it on a grill really at all - smoker - yes - hot grill - no because many times it gets overcooked, dry and tough, unless you are meticulous about watching the temp. Great article and great cookbook. Thank you for promoting goat meat. Our goat meat is much less gamey/muttony than lamb. I raise kinder goats, they have win taste tests against other breeds of goats, what you day is true about most goat meat. My bucks don't taste gamey at all. Most people will never get to taste such good meat, unless you raise it your self.